This is our blog. If you are interested in purchasing South Africa Mint sovereigns click this link. The Royal Mint opened a branch mint in Pretoria, South Africa in 1923. This was the last mint that The Royal Mint established overseas. 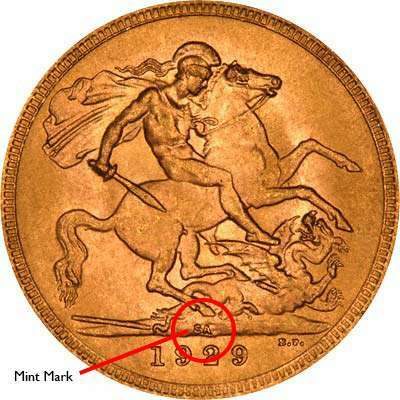 Although the mint was officially opened on 1 January 1923, the first sovereign was not minted until later that year. In 1886, gold had been discovered in Langlaagte on the Witwatersrand in South Africa (close to modern Johannesburg). This led to South Africa becoming the largest producer of gold in the world. Initially the land was in the hands of the Boers. They were defeated in the Anglo-Boer War (1899–1902) and in 1910, the British created the Union of South Africa, a dominion of the British Empire. You can identify a South African mint sovereign by the SA mint mark on the reverse of the coin. The SA is located above the year date in the ground below the main design. Sovereigns struck in the Pretoria mint are usually called South African Mint Sovereigns or South Africa Mint Sovereigns. They are not usually referred to as Pretoria mint sovereigns. 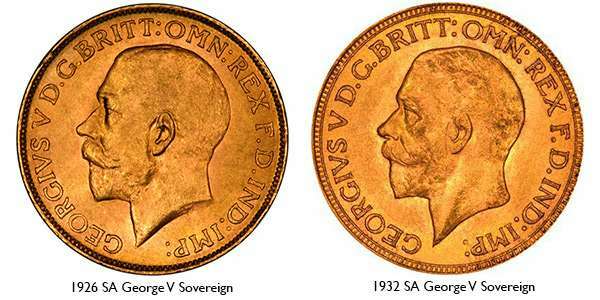 You will often see South African sovereigns referred to by the date followed by SA, eg: 1932 SA George V Sovereign. There were two portraits used on George V sovereigns minted in South Africa. The large bare head used between 1923 to 1928 and the smaller bare head which featured on sovereigns between 1929 and 1932. Sovereigns were used in South Africa with the same value as sovereigns in Great Britain; one pound which was twenty shillings. These sovereigns were struck to the same specifications as the original modern sovereign which was introduced in 1817. In 1941, The Royal Mint in Pretoria cut its ties with The Royal Mint in London and became known as The South Africa Mint. Today, The South Africa Mint produces the countries circulation coinage as well as probably the most famous one ounce gold bullion coin in the world; the Krugerrand. Between 1923 to 1932, a total of 83,442,397 South Africa sovereigns and circulation coinage were minted at The Royal Mint in Pretoria. This was the last overseas branch mint to be set up by The Royal Mint. * Marsh reports that the South African branch mint issued 460 sovereigns in 1923. Krause seems to suggest that the mintage is 64 for circulation issues and 655 for proof issues. Many of the South Africa mint sovereigns were melted down so the rarity of each year is not always in proportion to the official mintage figures. Both 1923 and 1924 are rare years. The first South Africa mint sovereign to be struck in 1923 was a currency sovereign for circulation. Both the proof and circulated 1923 sovereign are rare and highly sought after. Only 584 sovereigns were struck by the SA mint in 1923 making this one of the most sought after years. This is followed by the 1924 SA sovereigns of which only 2,660 were issued. As with previous branch mints in Australia, Canada, and India, the primary role of the South Africa branch was to produce gold sovereign coins close to areas where gold was being mined. It was a far more time efficient and cost effective method to produce the coins in the countries where the sovereigns would be used, than to send the gold to London to be minted. Between 1855 and 1932, these overseas branch mints struck over 564 million gold sovereigns. If you do not find what you are looking for either visit our old site goldsovereigns.co.uk or call us on 01253 343081 and we will check availability.